Picasso had just persuaded Francoise to leave her family and move in with him. This conquest stimulated Picasoo to produce a clster of portraits. But the form taken by these pictures frames the union between teo other forces: Picasso's dialogue with another artist and his remembrance of his own past work. The other artist was of course, Matisse. Francoise and Picasso visited Matisse during the early spring of 1946 while their relationship was still secret. She was simply introduced as a young of interest. Matisse responded by describing how he would paint her portrait. 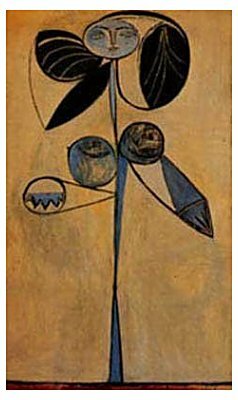 Picasso reacted as if Matisse had become his rival in love as well as art. He seemed goaded to possrss Francoise more fully through his art and demonstrate his superiority to Matisee in the same act.